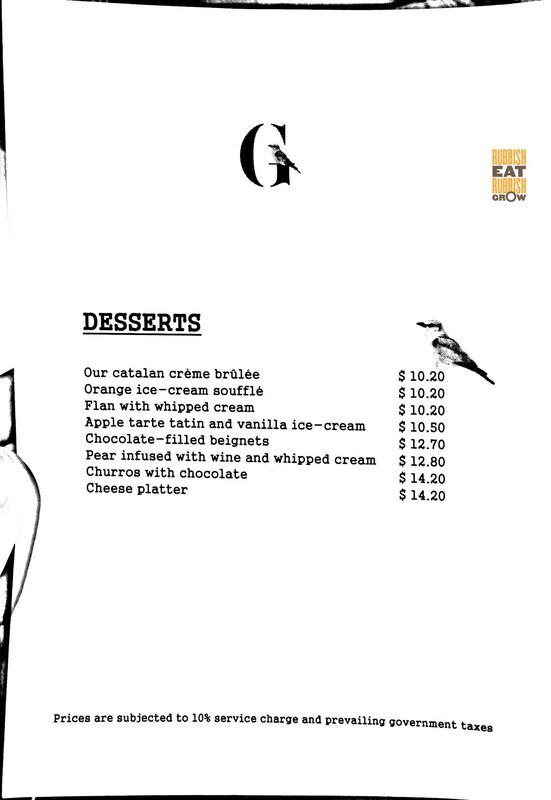 Restaurant Gaig at the Telok Ayer district is the outpost of the Michelin-starred eponymous restaurant in Barcelona. The Barcelona restaurant was first established in 1869, and won its Michelin star in 1993. The winning factor is that it is a family-run restaurant using family recipes for 5 generations. 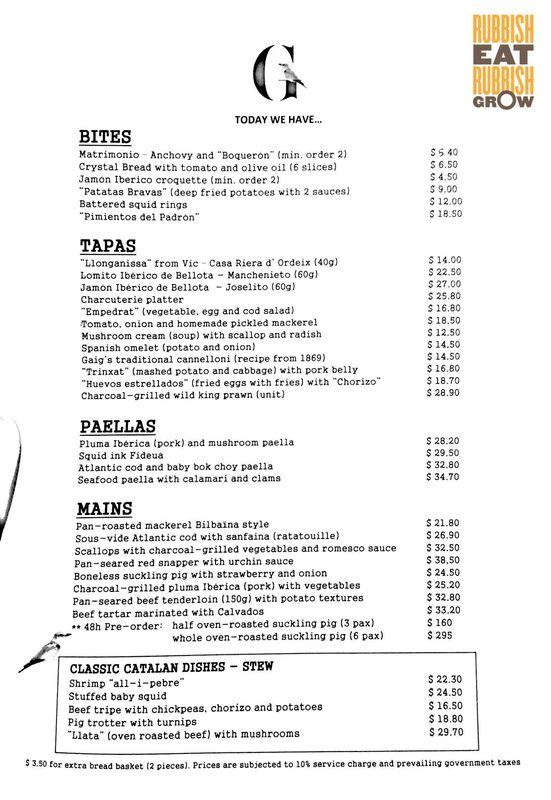 The menu includes tapas, paellas, and classic Catalan stews, a rare find in Singapore. (LIFE HACK: When you order stew, keep some bread to wipe up the stew.) The restaurant offers a set lunch that includes a selection of three tapas and a main for $38++, and with the addition of dessert for $45++. The a la carte menu is served for both lunch and dinner. Almost everything is homemade or imported from Spain, from beer to bread. I almost always never talk about the gratis bread, but here, the bread is crusty and warm with a pinch of salt. The olive oil is out of the world, so pristine and invigorating. There were (1) some good dishes, (2) some fantastic dishes, and (3) some dishes that require a few bites to fall in love with them. The cannelloni is a traditional cylinder pasta stuffed with foie gras, beef, and pork, drenched in truffle cream. The shredded meat was a tad dry, but the flavors packed an umami and the cream is thick and strong and lovely. Moving on (2) the fantastic dishes: the shrimp “all-i-pebre” ($22.30), a stew, is soaked in a nutty seafood stock, slightly spicy from pimenton, a Spanish paprika. The calamari (above) comes as a whole on a sushi board, and the chef slices it between the eaters. It’s doused in a suckling pig sauce; the two kinds of sweetness from squid and sauce play off each other. The tentacles of the squid is coated very lightly with flour and deep-fried; great flavors. If it gets a little too salty—it didn’t for us–the deeply charred pumpkin, sweet and bitter, undercuts the saltiness. The third category, dishes that require a second bite: beef tripe ($16.50) needs some getting used to but after we took the second bite, it was fantastic. At first, we thought it was stewed pork rind, and it tasted like such. But after a while, the robustness hit us. Bits of potatoes give the stew a thickness and in return, they absorb the stew: super delicious. This dessert too takes some getting used to, because it is the first time we had eaten it. It’s called orange ice-cream souffle ($10.20) but it’s neither ice cream nor souffle. The airy texture is almost spongy like a souffle but it melts in the mouth like ice cream. A refreshing end to dinner.